The work songs find their origin in a biological and psychological pattern : the lullaby, as an echoing activity between mother and son. This pattern, which combines rythm and melody, actives in the adult being a double memory skill: procedural and semantic. The work songs, which combine the two skills, were a current practice in the organic, non stratified cultures. They have been marginalized, on the contrary, in the modern, stratified societies, where the division of labor asks an highly formalized action, in view of a higher efficiency in productivity. To avoid alienation, the modern society learns to combine, in work itself, love and duty. The beginning of the third part of the De cultura hortorum (On the cultivation of the gardens) composed by Walahfrid Strabo in the first half of the IX century is a manifesto of poetics of work applied to the small reality of a monastic garden, which can be read as an allegorical interpretation, on the basis of Virgilian models re-used with masterful elegance, of the laborious effort of the Carolingian renaissance. This article tries to explore the ways in which the issues related to labor have been represented in South African poetry both during the apartheid regime and in the post-apartheid era, turning out to be a crucial theme in the political and cultural history of the nation. The article focuses on the anthology Black Mamba Rising: South African Worker Poets in Struggle (1986) and on the vast scenario of contemporary South African poetry, providing the translations of two poems by Raphael d’Abdon and Philippa Yaa de Villiers. The rapid economic growth that China has been able to achieve in the last years is now clearly visible to everyone, not only to experts and specialists in the field; however the social and cultural changes produced by this undeniable development have raised several concerns, which have been discussed in the socio-political realm and in the literary field. Social inequality produced by the economic reforms of recent decades has particularly affected the dagongren: the migrant workers from the rural areas of the country. The difficulties faced by the dagonren became a literary question when some intellectuals began to analyse the living conditions of migrant workers. Since they focused the attention on the possibility of a lower-rung writing in poetry, which could represent these new social subjects, they particularly gave prominence to the migrant worker Zheng Xiaoqiong and her poetry. The aim of this article is to present the main aspects of Zheng Xiaoqiong’s poetry and her contribution to contemporary Chinese literature after a brief introduction on latest poetry debates. In french language (mainly the old one), ploughing is said "labour" , which is more or less the same word as the latine "labor" meaning work.In the middle of the 19th century, mainly during the years before the Revolution of 1848, George Sand is among utopian writers , as it appears in what is called her "rustic novels", for instance the short "Mare au diable" ("(A devilish pool") the preamble of which is making her thoughts perfectly clear. At the beginning of the story, a country man is described as he is ploughing with oxen, according to an engraving by Holbein. Commenting upon his action, George Sand expresses a feeling that her society is unfair to rustic workers, whose work is considered as a curse, while it is mainly dedicated to maintain people in life.But how to convince the "good society" that a peasant performance is of the highest dignity? Work play an essential role in the conquest of autonomy and responsibility. Such conquest changes the social structure and the common value system: the classical opposition between city and countryside becomes less and less operative, and its social involvements are assumed by the urban space. Two different attitudes emerge in France, which are chronologically subsequents : they can be defined in terms of a progressive emancipation from the pretextual, often ideological celebration of countryside towards the achievement of autonomy in the new urban space. In the first part of the nineteenth century the Rousseau’s heritage is in fact dominant, mostly in Nerval and George Sand’s writings, where nostalgic and dreaming attitudes towards countryside are synonymous of poetical sensibility; in the second part of the same century, the dialectics of the citizenship and different formal aspects of industrial work are assumed by poets, and invested in their texts as discontinuity and rupture. Baudelaire and Mallarmé represent this new attitude. In particular, the « chiffonnier » becomes, by the reinvestment of industrial waste, the model of poetry work. Modern times have mainly substituted necessary links between means and aims to contingent ones. This technological state of things has killed uncertainty which was the poetical heart of feudal works. Not only acts but also thoughts have turn into stereotypes at works as at home. Free time itself is now ruled by economical and impersonal necessities. Marx shows us both the reality we don’t want to see and the possibility we can’t imagine, which is what poetry does. Hence the reading of Marx has do deal with poetical responsibility. Everything comes to us from the world, but little is of real help. Our vision of the world is restricted by the tricks of the organisation of labour, under the changing forms of the working system. We can hardly play any part in the course of things and life. We are all contemporaneous and dispossessed, in a world that is the doing of mankind, but that has become inhumane. The question of the work as reference to the evaluation of a human activity bases on numerous criteria as social, economic and cultural, but the artistic work does not fit to these categories, specially the quantification by the time as attempt to express the value of an artistic work. Thus other considerations are required, until, according to a Taoist view, the intimate work, although invisible and thus contradictory of the representations usually accepted. The Saxon poet, playwright and novelist Volker Braun (born in Dresden in 1939) repeatedly conceptualizes in his verses his commitment to the question of how labour, and/or its absence, affects human condition and its bond to nature. By virtue of an always watchful eye, the socialist poet has addressed the tenets of work in both GDR society and post-unification contemporary German over the last 50 years, establishing his critical voice as one of today’s most remarkable examples of socially committed literature. The essay is intended as an endeavour to pinpoint the landmarks of how the poet’s idea of labour shifts and evolves from 1965 into the 2000’s. Rory Waterman, Windfalls and Tinned Sardines: Philip Larkin and the Toad Work. The author considers Philip Larkin's poetry and outlook regarding the working life. The paper presents the theme of work in Czech modern and contemporary poetry, tracking its path since its occurrence in the context of XIXth century socialist movements, through its misuse and distortion during the communist era. The ideological connotation in this poetry, although predominating, is not the only one: other declinations of the subject, signalizing its presence in anti-ideological contexts and independent poetics, are examined in the paper and shown in the anthology of twenty poems translated into Italian which follows. This essay examines the role of female characters in The Beautiful Poldi (1950) and Jarmilka (1952) by Czech writer Bohumil Hrabal. Despite the different genres in which they are presented (an „Epos“ in verses and a „Document“ in prose) both writings are inspired by the author’s experience at Poldi steel plant and deal with the theme of work. Through the personification of the Beautiful Poldi and the meeting with a humble maid named Jarmilka, work is seen as a physical dimension where passion, misery and dignity are entangled. Fascinated by Poldi, the cruel and seducing foundry, and touched by Jarmilka’s story of violence and determination, Hrabal shows how a woman’s perspective can, more than any ideology, lead to a profound comprehension of the true meaning of human work. 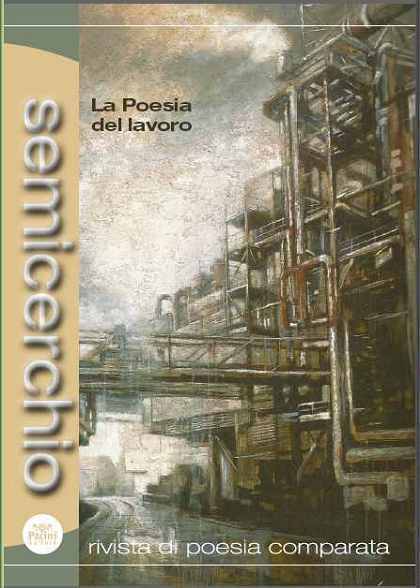 Selection of poems about work from Mario benedetti, Antonio Gamoneda and Migiel Hernández, translated in Italian under the direction of M. Canfield. (Martha Canfield, Università di Firenze, martha.canfield@unifi.it). Fabio Zinelli, Epifanie del lavoro. Un’antologia. Twenty-nine prominent Italian poets have been invited to write texts on work both as a social phenomenon influenced by all sorts of external and subjective factors such as politics, gender and language. Any direct allusion to the ‘work of writing a poem’ had to be kept out of the text. The introduction by F. Zinelli presents the literary framework in which these poems can be read. name through the authorial name, when work definitively becomes the “craft of writing”. Daniele Comberiati, I precari del verso. La tematica del lavoro nella poesia migrante italofona. The article reflects on thematic of the “work” in the poetry of the Italian migrant writers. For the Italian migrant writers, at the beginning of 1990 (Pap Khouma, Gëzim Hajdari), the “work” is an important theme, because they described the reality where they lived and in their lives to find, to have, to preserve a work are the fundamental elements. It’s undeniable that, at this moment, the relationship between literary creation and historical reality in these writers is extremely close. At the second moment, for the writers more young or of the second generation (Nader Ghazvinizadeh, Ubax Cristina Ali Farah) the “work” becomes a metaphor to describe the creative act. “To work”, in a society where the poetry has a so little space, means for these writers a way to mark their difference and their identity. The works of these poets, through the use of the Italian language, create an efficient standpoint for evolving the contemporary poetry. A brief anthology of contemporary American poetry on work (in English and in Italian translation) showcasing texts by C.K. Williams, Jorie Graham, Philip Levine, and Yusef Komunyakaa whose text is published here for the first time along with a prose on carpentry and poetry. In the introduction, Antonella Francini briefly discusses Levine's celebrated book What Work Is and puts it in the context of the theme of work in American poetry as one of its major subject-matters since colonial times. Gregory Dowling, “Play for Mortal Stakes”: Work and Play in the Poetry of Robert Frost. The essay considers the importance of the theme of work in Robert Frost’s poetry. The descriptions of physical activities of agricultural life in his poems have often been treated by critics as metaphors for poetry; this essay considers them from the literal point of view, in an attempt to appreciate the realism of his pictures of physical labour. The author analyses the presence of the topic of work in the Italian popular songs of the last decades, focussing on the changes of the point of view according to the social evolution and focussing on the continuity of some threads and on some more innovative results. (Massimo Arcangeli, Università di Cagliari, info@massimoarcangeli.com).